Controversies over public displays of religious symbols on government property annually pop up during the holiday season. For example, Florida officials faced a quandary again this year when they invited religious groups to erect displays in the State Capitol building and wound up not only with a Christian nativity scene but also with an atheist’s “Festivus” pole made of beer cans and a local satanic temple’s depiction of a fallen angel. Such controversies often end up in the courts, creating a set of legal precedents that public officials – and their lawyers – have to take into account at this time each year. A new Pew Research Center survey finds that 44% of Americans say Christian symbols like nativity scenes should be allowed on government property even if they are not accompanied by symbols from other religions. In addition, 28% of U.S. adults say that such symbols should be permitted, but only if they are accompanied by symbols from other religions, such as Hanukkah candles. One-in-five (20%) say there should be no religious displays on government property, period. Advocates on both sides of these disputes can take some heart in Americans’ views. On the one hand, nearly three-quarters of U.S. adults (72%) favor allowing Christian symbols on government property in at least some cases – either by themselves or with symbols from other faiths. Looked at another way, however, nearly half of Americans (48%) express reservations about these displays, either saying that Christian symbols must be accompanied by those from other faiths or that no religious displays should be allowed on government property. The new survey also suggests that most Americans believe that the biblical Christmas story reflects historical events that actually occurred. About three-quarters of Americans believe that Jesus Christ was born to a virgin, that an angel of the Lord appeared to shepherds to announce the birth of Jesus, and that wise men, guided by a star, brought Jesus gold, frankincense and myrrh. And eight-in-ten U.S. adults believe the newborn baby Jesus was laid in a manger. In total, 65% of U.S. adults believe that all of these aspects of the Christmas story – the virgin birth, the journey of the magi, the angel’s announcement to the shepherds and the manger story – reflect events that actually happened. Among U.S. Christians, fully eight-in-ten (81%) believe in all four elements of the Christmas story. Even among people who are not affiliated with any religion, 21% believe all these events took place, and 37% believe at least one (but not all) of them occurred. These are among the main findings of a new Pew Research Center survey conducted Dec. 3-7 among 1,507 adults. 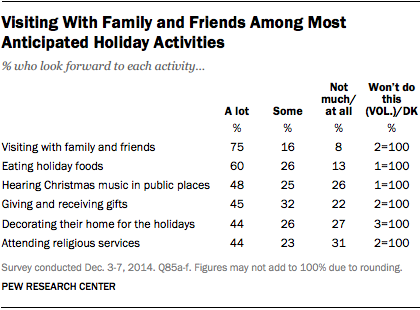 The survey also finds that the holiday season brings both joy and stress for many Americans. When asked about their feelings on buying and receiving holiday gifts, many people express mixed emotions. More than eight-in-ten Americans say the thought of exchanging gifts makes them feel joyful (83%), and nearly as many say it makes them feel generous (78%). At the same time, 46% say the prospect of exchanging holiday gifts makes them feel stretched thin financially, 36% report feeling stressed out about buying and receiving gifts, and about a quarter (23%) feel wasteful. Feeling financially burdened by the holidays is closely linked with household income; nearly six-in-ten people with family incomes of less than $30,000 say they feel stretched for money when they think about buying gifts, compared with just a third of those with family incomes of $75,000 or more. All in all, a majority of Americans (53%) express mixed emotions – both positive and negative – about buying and receiving gifts. More than a third have only positive feelings about gift-giving, saying it makes them feel joyful or generous (or both) but not stretched thin, stressed out or wasteful. And 7% express only negative feelings (financial strain, stress, wastefulness) about exchanging gifts. A plurality of Americans (44%) say that Christian symbols such as nativity scenes should be allowed on government property during the holidays whether or not they are accompanied by symbols from other faiths, while 28% say Christian symbols should be allowed on government property only if accompanied by other religious displays (such as Hanukkah candles). 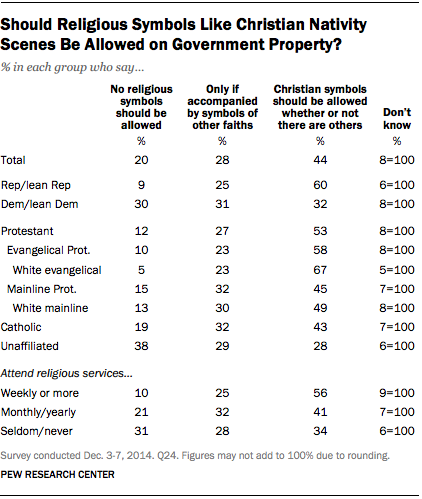 One-in-five (20%) say that no religious symbols should be allowed on government property. Most Republicans and those who lean toward the GOP (60%) approve of Christian displays in public spaces, even if they are not accompanied by displays from other faiths. One-quarter of Republicans say Christian displays should be permitted only if accompanied by other religious symbols, and just one-in-ten (9%) say that no religious symbols should be permitted on government property. Democrats and those who lean toward the Democratic Party, by contrast, are much more evenly divided on this question. Similar shares choose each of the three options: that Christian symbols should be permitted by themselves (32%); that such symbols should be allowed, but only if accompanied by other religious displays (31%); and that no religious symbols should be displayed on government property (30%). Nearly six-in-ten evangelical Protestants (including two-thirds of white evangelicals) say Christian symbols should be allowed on government property regardless of whether or not other faiths are also represented. Fewer mainline Protestants (45%) and Catholics (43%) say the same. Among the religiously unaffiliated, nearly four-in-ten (38%) say that no religious displays should be permitted on government property, while 29% think Christian symbols should be allowed if accompanied by displays from other religions, and 28% say Christian symbols should be allowed even by themselves. Nearly three-quarters of U.S. adults (73%) say they believe that Jesus Christ was born to a virgin. One-in-five do not believe in the virgin birth, and 6% say they don’t know or decline to answer the question. These findings are virtually unchanged compared with 2013. The new survey also asked whether other elements of the Christmas story reflect events that actually happened. Fully eight-in-ten Americans (81%) believe that the newborn baby Jesus was laid in a manger. Three-quarters believe that wise men, guided by a star, brought Jesus gifts of gold, frankincense and myrrh. And 74% say the account of an angel of the Lord appearing to shepherds to announce the birth of Jesus reflects an event that actually occurred. Across all four questions about the Christmas story, women are more likely to express belief than men. And belief in the Christmas story is more widespread among respondents who have not completed college than it is among college graduates. However, there is little sign of a consistent generation gap on these questions. Evangelical Protestants are the most likely to say they believe in each of these four events, with 94% or more expressing belief in each. Strong majorities of Catholics and mainline Protestants also believe in all of these elements of the Christmas story, though they are somewhat less unanimous in their belief. Religious “nones” are far less likely than Christians to believe in the elements of the Christmas story mentioned in the survey, though substantial shares say they believe in the magi’s journey to visit Jesus (41%) and that Jesus was laid in a manger as a newborn (53%). Fully 65% of American adults believe in all four of these elements of the Christmas story – the virgin birth, an angel announcing the birth of Jesus to shepherds, wise men following a star to bring gifts to Jesus, and that the baby Jesus was laid in a manger. Just 14% say that they do not believe any of these events actually happened (including those who responded to an earlier question by saying they do not believe Jesus ever actually lived, and were therefore not asked about other parts of the Christmas story). 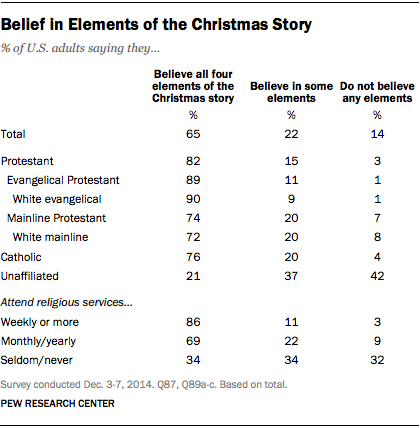 About one-in-five (22%) have mixed views on the Christmas story, saying they believe in at least one element, but not all of them. Nearly nine-in-ten evangelical Protestants (89%) say they believe in all four of these parts of the Christmas story, as do roughly three-quarters of Catholics (76%) and mainline Protestants (74%). Among religious “nones,” 21% believe in all four elements of the Christmas story, 37% believe in at least one (but not all), and 42% do not believe that any part of the Christmas story mentioned in the survey reflects an event that actually occurred. The vast majority of Americans (91%) say they look forward to visiting with family and friends during the holiday season, including three-quarters who look forward to this “a lot.” Six-in-ten U.S. adults look forward “a lot” to eating holiday foods. Smaller numbers express this level of anticipation about hearing Christmas music in stores and other public places (48%), giving and receiving gifts (45%), decorating their homes for the holidays (44%) and attending religious services (44%). Fully two-thirds of evangelical Protestants (68%) say attending religious services is a part of the holiday season they look forward to “a lot.” About half of Catholics (48%) and 42% of mainline Protestants say the same. Just 12% of the religiously unaffiliated say they look forward “a lot” to attending religious services during the holiday season. 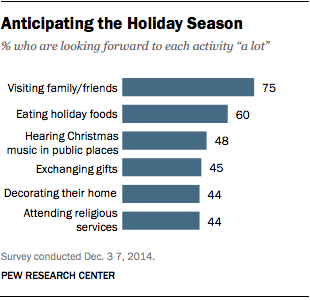 Religious differences are smaller on the other questions about what people look forward to during the holidays. Overall, Americans who attend religious services regularly are more enthusiastic about the various activities associated with the holiday season than are those who attend worship services less often. Those who attend religious services at least a few times a year are more likely to look forward “a lot” to all of the activities mentioned (with the exception of eating holiday foods) when compared with those who seldom or never attend religious services. For example, roughly half of respondents who attend religious services at least once a year say they are looking forward “a lot” to giving and receiving holiday gifts and to decorating their home for the holidays. Among those who seldom or never attend religious services, one-third or fewer share these sentiments. Women also tend to be more excited than men about holiday activities. While roughly equal shares of men and women say they look forward to visiting with friends and family during the holidays, women look forward to every other activity measured by the survey more than men. Americans who are married or living with a partner are more likely than those who are not to look forward to many of these holiday activities. And parents with children under 18 at home are more inclined than others to look forward “a lot” to giving and receiving holiday gifts (52% vs. 41%) and decorating their homes for the holidays (53% vs. 40%). Eating holiday foods, exchanging gifts and decorating are more highly anticipated by adults under age 50 than by older Americans. By contrast, Americans ages 65 and older are more excited than younger adults about hearing Christmas music and attending religious services. More than eight-in-ten U.S. adults (83%) say thinking about buying and receiving holiday gifts makes them feel joyful, and nearly as many (78%) say the prospect of exchanging gifts makes them feel generous. Still, 46% say exchanging gifts makes them feel stretched thin financially and 36% say it makes them feel stressed out. About a quarter (23%) say the thought of exchanging gifts makes them feel wasteful. Household income is closely connected to whether people feel financially burdened by exchanging holiday gifts. Nearly six-in-ten of those who have an annual household income of less than $30,000 (58%) say gift-giving makes them feel stretched thin financially, compared with a third of those with an income of $75,000 or more. But while most lower-income Americans feel financially strained by the prospect of December gift-giving, most do not report feeling “stressed out” about buying and receiving gifts. U.S. adults under the age of 30 are more likely than older adults to say gift-giving makes them feel generous. And Americans ages 65 and older are somewhat less likely than younger adults to say exchanging gifts makes them feel stretched thin financially or stressed out.